People have asked how we choose where to place our units. Because this work is being done in preparation for the excavation of a basement, our site limits are those areas which will be impacted. So, the area inside of the house where the basement will be dug as well as the area outside of the house where the equipment will be driven and a ramp for the bulldozer created. We have begun opening units in the northern-most area of the site to determine what might have been located there and how deep the cultural deposits, if any, are. 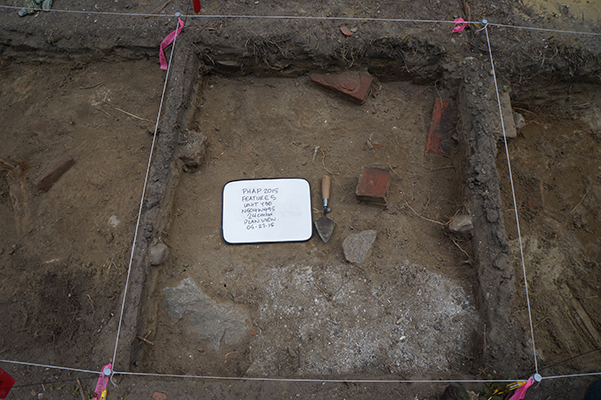 What we have discovered is some very large granite boulders below the surface, some burned brick, and a clearly defined area with ash and cinder. The question for us now is what that might indicate. Do you have any ideas? School visits have been a wonderful part of this project and we have been very lucky to have some great kids working with us. Today, students from Ms. Cleary’s class at R.K. Finn Ryan Road Elementary School came to visit our site. They worked hard at excavating the site, processing the artifacts, and – most important- carefully documenting where they were excavating. At the end of every visit, we have the students write a reflection on their experience. It can be a picture or a few sentences on archaeology, the Parsons House, or anything that piqued their attention. We’ve learned that when the neighborhood cat comes to visit, we will have lots of pictures of that cat! This is an image of feature 5- the area with the ash and cinder. We carefully document it because the next step is to remove it. Once it’s gone, that data is also lost. 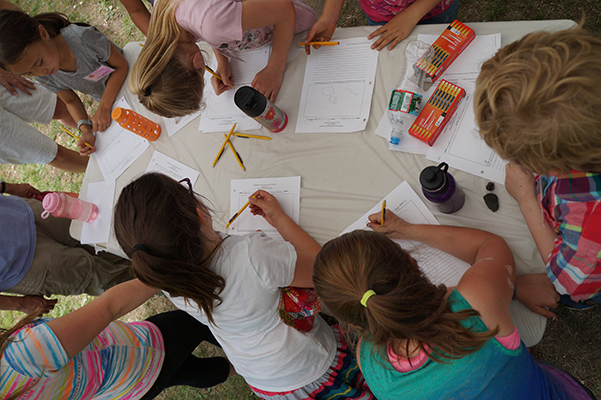 Children reflect on their experience at the Parsons House Archaeology Project.